INTRODUCTION: Occasionally blurbs are a tricky thing to do right; based on the one below I was somewhat dismissive of "The Last Page" in my 2010 Anticipated Books post - the debuts section. And I was quite wrong since the novel turned out to be *the* best 2010 sff debut I've read out of some 28 2010 sff-nal debuts I've gotten to so far and likely to stay there considering the offerings for the rest of the year. Incidentally the blurb is accurate but just does not convey the extreme inventiveness of the novel and the superb mix of high magic and steampunk which are its strong points. 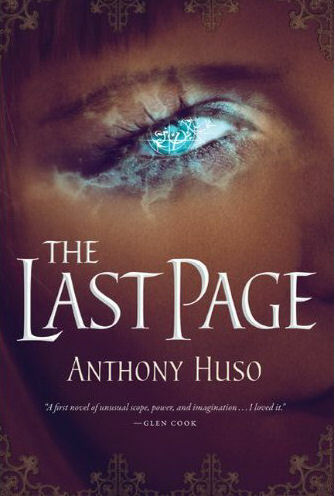 FORMAT/CLASSIFICATION: "The Last Page" stands at about 430 pages divided into 42 numbered chapters. The POV's alternate between Caliph Howl and Sena whom we first meet as students of the High College. Caliph is taking extra classes and postponing his graduation and return to Isca as much as he can to avoid becoming High King of Stonehold under the federation's succession rules. Those left him heir-in-waiting for almost 20 years since the death of his uncle and last King, while a ruling Council has manged things so far. Sena is secretly a witch from Shradnae and not only that, but a powerful one groomed as heir-in-waiting to the Witchocracy leadership by the current ruling "Mother" Megan. Sena does not really like the plans that others have for her either - especially that Megan had her birth mother burned at stake for "heresy" after winning the struggle for power. So she attends High College despite the wishes of Megan using money from one of her tepid but rich lovers whose father is more than happy to pay and keep her away from his son. A mix of steampunk and high magic, The Last Page is "sense of wonder" fantasy at its best. The book finishes with a great twist for quite a complete ending, while we will see the rest of the story in the 2011 sequel Black Bottle. ANALYSIS: I have not encountered the inventiveness, sense of wonder and generally the "many goodies" of The Last Page in a debut - all packed in a reasonable 400 odd pages - since John C Wright's Golden Age and Gary Gibson's Angel Stations, though this one is fantasy with blood magic, necromancy, mysterious and ultra-powerful beings as well as airships, guns, newspapers and a "steampunk" like setting with an early industrial flavor. The main technical achievement of the novel is to seamlessly combine and balance the two quite disparate aspects above. This may seem easy but it can easily go awry with either one side taking over for an extended number of pages or the two aspects just grinding against each other rather than meshing together as recent reviews of mine have noted. The main characters Caliph and Sena are very interesting and while their relationship is a main part of the novel - though not necessarily in obvious ways - their independent actions are quite important also. Adding to the main POV's, a great supporting cast of witches, spies, former college friends, devoted servants and mysterious personages bring the wonderful universe created by the author to vivid life. 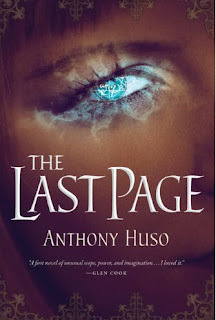 The Last Page has many "little" touches adding to its depth: from the number of minutes in an hour and hours in a day which I leave to the reader to figure out to macabre descriptions of Isca's underworld and abandoned "haunted" estates. For people craving action, the novel has that galore with assassination attempts, high magic confrontations, ground battles as well as airship fleets contesting the sky. The Last Page solves the main thread of the novel but the stunning ending promises that the sequel and duology ending Black Bottle should be one for the ages too. If there is one 2010 sff debut you want to check, I strongly recommend The Last Page (A++) since it is the best and has a wide spectrum of "goodies" inside to satisfy both the experienced fantasy reader and the more novice one. I could have sworn that you previously reviewed this book. Not that it matters. I've read something in the past month that put this book on my list; your review is merely confirmation. Thank you for your kind words; I had a post about The Last Page after I finished it some months ago, though it was more of a "wow" short post, not a review. This novel impressed me a lot and maybe unexpectedly based on the blurb. I've just finished the book, and feel that its a great first book. The variety and melange of SF/Fantasy genres is pretty well done all things considered as a first time author. However, as one of the comments on Amazon mentioned, everything but the kitchen sink has been thrown into the story. The end of the story was really rather poorly done in my view. The plot thread wherein the 2nd Protagonist Sena transforms into a god-like Transcendental All Powerful being seemed to be crammed into the ending as a minor after thought, compared to all the detail and time spent on other details of the story/plot. And some of the storyline was just plain stupid/pointless. Sena is shown to be very bright, and is in fact a covert agent. Yet while she knows her BFF and adopted city are in the midst of a battle for the right to rule, she's taking time out to have retainers go out to her BFF's old family estate and track down a monster? I could go on and on about how the author seems to have tried to copy not only Lovecraft's Mythos, but also duplicate his style of over the top embellishments and excessive wordplay. With Lovecraft did it, it was mesmerizing, and almost hypnotic as you were pulled along, word after word. However in this work, especially at the end, its became almost impossible to figure out what was happening, why, how, etc. There are many ways to get across to the reader that there is a maelstrom of sights, sounds, manifestations, other worldly intercessions occuring. Take a large pile of words and throwing them against the wall appeared to be what this author did. I hate to say it, but the last 15-20% of the book seemed very disconnected, with odd and non-logical actions by characters, etc. Disappointed me after a lot of the ingenuity, and dedication of time and pages to early story/plots.